One of the things I like most about designing with crochet, is that I can let my imagination run wild. I am often amazed where the ideas come from, whether it is the colours I use or the combination of stitches, it all seems to magically blend together. ♥ With modern crochet, we are not limited with colour, shape, or stitches. And so, here is Star of Wonder, an 8-sided blanket! ♥ It lays beautifully on a bed, with four of the sides cutting across the corners of the bed. Eight sided stars have been used throughout history, by many different cultures. To signify great celestial events, the wheel of the year and celebrated festivals. It can symbolise bringing order to chaos, it is also known as the symbol of creation, often depicted as a sun, the giver of life. ♥ I started designing with yarn from my stash, all Stylecraft Special Double Knitting, working with three shades of each colour of the rainbow. I do love rainbows! Though I have gone for a bright rainbow, it would work equally as well as a pastel rainbow, for those who like a softer colour pallet. Burgundy, Claret, Lipstick, Copper, Spice, Apricot, Gold, Saffron, Citron, Green, Grass Green, Spring Green, Empire, Turquoise, Sherbet, Royal, Denim, Cloud Blue, Lavender, Violet, Emperor, Clematis, Magenta and Plum. Yarn packs are available from Deramores and Loremar. Deramores, Love Crochet or Woolwarehouse. For some this is easy, for others a minefield, fraught with too much stress! Choose your main colour (muted green in my case), now pick 3 shades in that colour, a light, medium and darker. I chose Duck Egg, Sage, and Teal. Now pick a colour on the opposite side of the colour wheel, for me Red (claret). Now pick a neutral, you can go light, medium or dark, I chose Mocha. For more help with colour choice please check out any of my blog posts on colour. Colour me Happy, A World of Colour, Choosing Colours for Your Crochet Projects. Yarn packs are available from Loremar, and Deramores. C1-Silver, C2-Cloud Blue, C3-Denim, C4-Midnight, C5-White. Aran Yarn Pack available from Deramores. Available from Deramores, Love Crochet or Woolwarehouse. ♥ I wanted this design to be different, so you can choose where you stop. At any point, up to round 51 you will have an eight-pointed star, from there onwards you will be filling in the valleys in the star to give an octagon. ♥ This is the star of Wonder one of my testers made, Danielle decided to be different and end on round 70, and then add a round of front loop double crochet and a round of folding single crochet, so that there are still points, and the valleys are only partially filled in. and she added these really cute bobbles to the points. Danielle used: Red Heart Yarn with a 5.5mm hook, in Medium Thyme, Frosty Green, Burgundy, Country Blue, Windsor Blue, Soft White, Coffee, and Gold. ♥ Also Ineke decided to make a cushion with the remaining yarn she had, and we worked together to come up with a pattern for you. You can choose to do both sides the same, Ineke reversed the colours, as you can see here in her black and white version. Or you can follow the plain back that is in the pattern. If you should decide to use only two colours, like Ineke, then just change colour each time the pattern tells you to, alternating each of your colours, except Round 35 which should be the same colour as Round 34, then just alternate again. Because we all seem to just love bright colours, this is Ineke’s second Star of Wonder. And last but not least… here are two Star of Wonders made by Terena. First her rainbow colours, all stylecraft special dk, just slightly different colours to mine. Terena used: Burgundy 1, Claret 1, Lipstick 1, Copper 1, Shrimp 1, Apricot 1, Sunshine 1 and a little bit, Citron 1, Lemon 1, Green 1, Kelly Green 1, Spring Green 1, Empire 1, Turquoise 1, Sherbet 1, Royal 1, Denim 1, Cloud Blue, 1, Wisteria 1, Violet 1, Emperor 1, Clematis 1 and a little bit, Magenta 1, Plum 1. And her gorgeous purple and green colour pallet. I would love to see your projects on Ravelry, or please do share on facebook. I want to purchase the pattern of Star of Wonder. Can it be downloaded after I use my credit card or does it have to be mailed? I am located in New York. One other question, I would like the photo written instructions, but there is no way to specify. How do I take care of these things? Would it be possible to use the pattern in chunky yarn? Hi helen! !, how are you,good I hope.,,I want to buy the pattern star of wonder,but the site won’t take my card, I have a green dot card, visa.,is thare any other way I can purchase the pattern?? I love the Star of wonder afghan pattern & also the round pillow. How much are the patterns in US dollars? Can you please explain row 10 better on the star of wonder please? I am making this my 3rd of your designs for a friend who loves all things red. I have chosen red as the main colour and it is looking wonderful. Thank you once again. You are truly gifted and generous allowing us all to experience your designs. 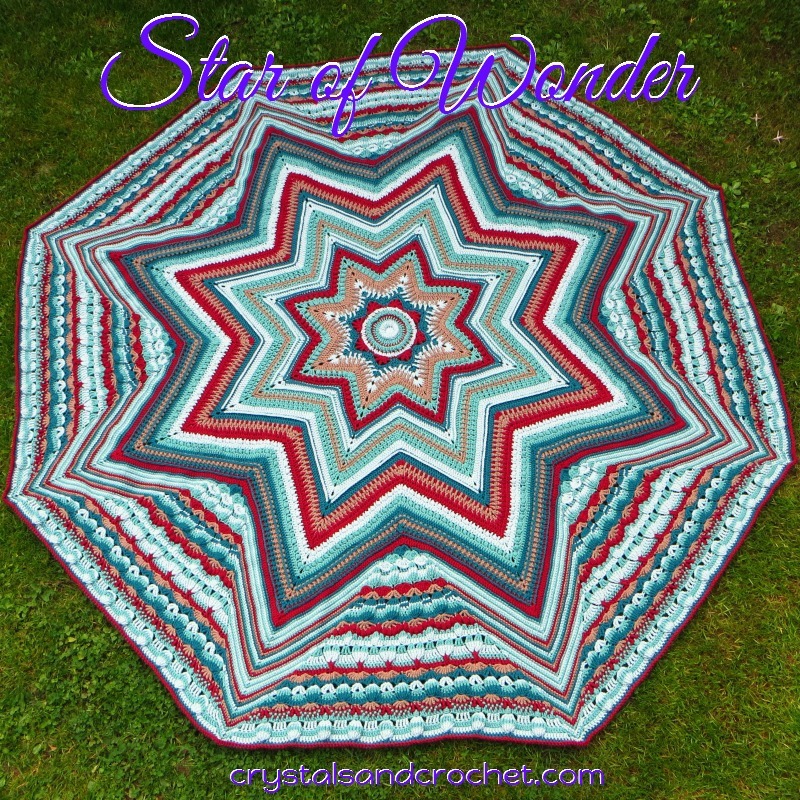 Love the star of wonder in rainbow colours, but how big is it in Stylecraft speciel DK? On row 19 on the written instructions compared to the picture. Is the picture count correct? It says there are 32 sc on each side and I get more than that on the picture. When joining the cushion, do you do sc2tog all round or just in the corners please? Thank you. What a lovely design. I especially like the rainbow version. Can I find the yarn color for each row of your rainbow version somewhere? I would like to make one myself in this color palette. Thanks in advance. Helen, thanks for this info. I will definitely give it a go. Would category of difficulty would you class this pattern as? Is the pattern in UK terms only? Or, UK and US terms? Such a beautiful pattern, thank you. Your talent just blows me away more and more with every pattern release. Do this recipt come in Norvegan or Danich? Beautiful design! How many rounds is the full version? Using worsted weight yarn, about how big do you expect it to be?